Screen the skin you’re in at this free, family-friendly event in honor of Melanoma Awareness Month! 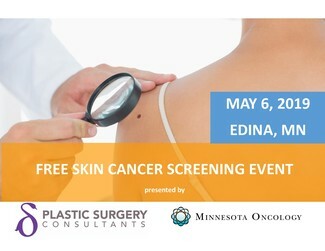 Minnesota Oncology and Plastic Surgery Consultants are hosting a free skin cancer screening and education on skin cancer and prevention! In order to be screened, you must click the sign up tab below and register. Please register each person individually. Please arrive no earlier that 10 minutes prior to your registered time. Please note: This free screen constitutes an initial skin cancer screening only and should not be used as follow-up care.